Julie Howard and Renée Stewart rehearse for the upcoming performance. Sara Michael and Mike Kennedy rehearse for the upcoming performance. 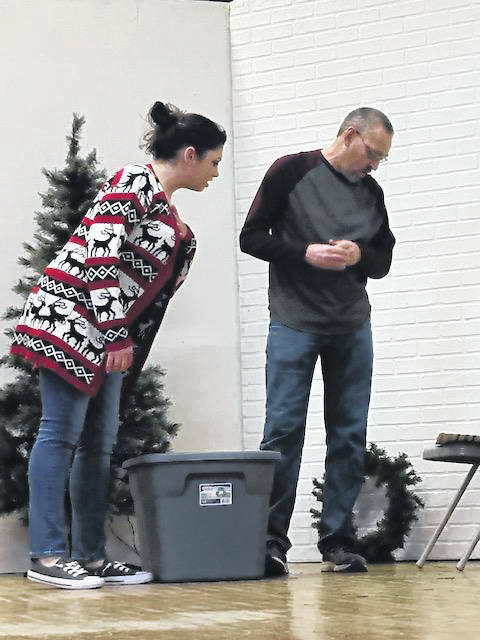 That line from the popular Christmas song “Sleigh Ride”, along with many others will be performed this weekend at Middleport Village Hall as part of the River City Players Christmas show. “Christmas: A Time for Love and Laughter” will be presented on Saturday at 7 p.m. and Sunday at 2 p.m. at Middleport Village Hall, located at 659 Pearl Street in Middleport. The program will include numerous holiday favorite song performed by local individuals and songs by the ensemble. Janis Carnahan is the director. River City Players cast members taking part in the event include Diana Bissell, Janis Carnahan, Rusty Carnahan, Tony Carnahan, Brian Howard, Claire Howard, Julie Howard, Nick Ingles, Nathan Jeffers, Mike Kennedy, Anna Lydle, Sara Michael, Brian Reed, Dixie Sayre, Renee Stewart, Gary Walker and Becky Zuspan. Tickets will be $10 for adults and $5 for children 12 and under. For more on this performance and other updated information on RCP, visit River City Players on Facebook. 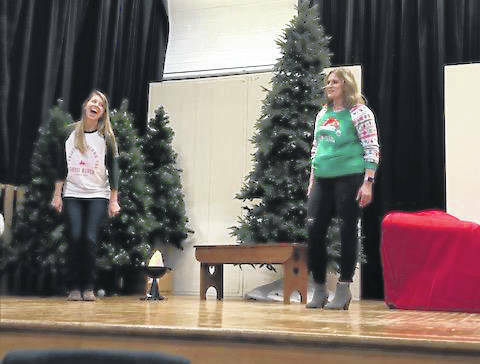 https://www.mydailyregister.com/wp-content/uploads/sites/24/2018/12/web1_12.5-RCP-1_ne2018124125951827.jpgJulie Howard and Renée Stewart rehearse for the upcoming performance. https://www.mydailyregister.com/wp-content/uploads/sites/24/2018/12/web1_12.5-RCP-3_ne201812412595375.jpgSara Michael and Mike Kennedy rehearse for the upcoming performance.